HE ORIGINAL - CLASSIC The origins of our Classic San Giuliano extra virgin olive oil, that in Italy is called l'Originale meaning the original one, lie within the most traditional Italian olive varieties combined with late autumn ripening to create a product which is full and fragrant. 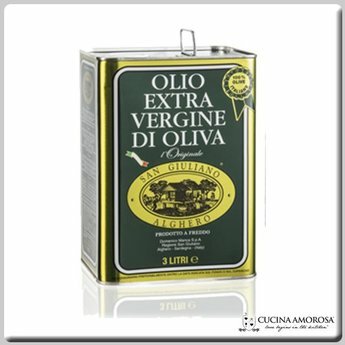 The Original Classic Extra Virgin is packaged by San Giuliano in customised dark green glass bottles designed to protect the product from ultraviolet rays and oxidation. OLIVE VARIETIES Bosana, Frantoio, Leccino, Semidana, Coratina. ORIGIN 100% Italian. PROCESS OF TRANSFORMATION Mechanically harvested directly from the tree from the end of November to January, then cold pressed with granite millstones, continuous cycle system, natural decanting and filtering. SENSORY CHARACTERISTICS Clear, golden yellow colour, fruity aroma of ripe olives, hints of almond and vanilla, a sweet and well-balanced taste with gentle spicy tones. HOW TO USE The Original Classic San Giuliano Extra Virgin Olive Oil is well-balanced and can be easily combined with all dishes. Excellent on seafood starters, vegetable purees, mixed fried vegetables, shellfish, fresh cheeses, fried sweets and cakes.